From the back cover: "After a perfectly decent local woman is killed during a robbery, The Witherspoon household receives a surprising visit from a stranger named Blimpey Groggins. He claims his best buddy was convicted of the crime. He also claims the peaceable chap didn't even know how to fire a gun. 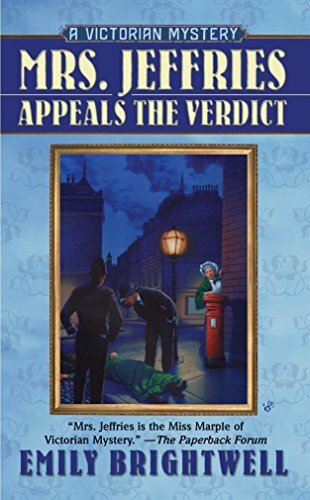 And considering he's to be hanged in three weeks, Blimpey's desperate to find the real killer. With the trail cold, the crime allegedly solved, and the evidence mucked up, Mrs. Jeffries and her belowstairs cohorts have their work cut out for them if they want to save an innocent man from the gallows." This was another delightful Mrs. Jeffries mystery. Released to my Recent Mysteries Virtual Bookbox. Mailed on Aug.7/07 to lane1088, who chose it out of the box. Enjoy! I got this in the mail yesterday but didn't get to journal till today. Thanks so much to Loveamystery for starting the virtual box and for sending this book. I am looking forward to reading my first Mrs Jeffries novel. This was a delightful mystery with some interesting characters. I liked the way the household staff solved the murders for their "inspector". Good read. I left this on the piano bench on the second floor near the ballroom.